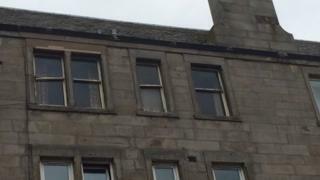 The body of an elderly man who died in an Edinburgh flat is thought to have lain undiscovered for more than three years. Henry Summers was found in his top floor flat in Easter Road on Wednesday by police after concerns were raised. It is understood that police officers had to break down the door of the flat to gain entry. A post-mortem examination is taking place and a report will be sent to the procurator fiscal. A 41-year-old neighbour told the BBC Scotland news website that he had known Mr Summers for 10 years. He said he last saw Mr Summers being stretchered out of his flat in February 2012. He never saw him return, and had assumed that he had died in hospital. "When it's someone you know you feel shocked. I'm very sad," he said. The neighbour added: "He would whistle when he went up and down the stairwell on his way to get his morning rolls and newspaper. "I would speak to him on the stairs, but he never speak about his personal life. "He was a very nice man. He was always clean shaven and always wore a flat cap and a light blue jacket. "He used to get a number 35 bus in the morning and return in the afternoon, but we never knew where he went and we never saw any family." Postman Michael Laidlaw, 41, who has been delivering letters to the flat for almost five years, said he had noticed a smell coming from the property. He said: "Every time I lifted his letterbox I thought something wasn't right, so I asked my colleague who used to live opposite the man's flat if he had seen him. He said no." It is believed that the alarm was raised when Mr Summers' GP contacted police because he had not been seen for some time. A Police Scotland spokeswoman said: "Police were called to a property on Easter Road following reports of concern for the safety of the male occupant. "The body of a man was found inside. The death is not being treated as suspicious and a report will be sent to the procurator fiscal."